At the time, Nelson Skalbania's Indianapolis Racers franchise of the WHA was not working out. That's an understatement. The team was a financial disaster, even with a young phenom like Wayne Gretzky playing. The Racers lost close to $1 million in 1978-79 (closer to $3.5 million in today's dollars, which is a good year in Phoenix, I suppose) and was not included in plans for a WHA-NHL merger that would eventually take place in 1979. 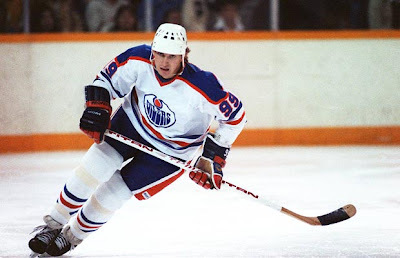 However dire the team's situation was, Skalbania had Gretzky, who he had signed to a seven-year personal services contract when the young prodigy was 17 years old. And Gretzky alone was going to make Skalbania a tidy profit. Skalbania called Michael Gobuty, one of the owners of the Winnipeg Jets, to talk about Gretzky. Of course, with the benefit of hindsight it's obvious Gobuty should have paid whatever Skalbania wanted, but at the time it was believed that Skalbania wanted too much money for the burgeoning superstar, and some of Gobuty's advisors—who aren't confirmed but Gzowski guesses was coach Rudy Pilous—weren't sold on Gretzky, thinking he was "too scrawny". "Tell you what," said Skalbania. "We'll play one game of backgammon. If you win, you can have him at your figure. If I win, I get a piece of the Jets." "I'm not that good of a backgammon player," said Gobuty. Next, Skalbania called Peter Pocklington, who agreed to Skalbania's asking price and Gretzky was an Oiler. Just like that, Gobuty lost out on the greatest hockey player ever, and Winnipeg Jets fans are left wondering whether they could have watched one of the league's greatest dynasties develop in Winnipeg instead of Edmonton. Anything could happen in hockey. Not really a hockey fan but I can associate this with basketball. There are different teams that will do whatever it takes to acquire the players they wanted.